Exactly one year later—on April 4, 1968—Dr. King was assassinated in Memphis while standing with that city’s striking Black sanitation workers. Recalling King’s fearless final year, and conscious of the challenge we face now in a new time of national crisis, faith leaders in Southern California will convene a major gathering for all who still seek to create King’s Beloved Community. April 4th, 7 p.m. to 9 p.m.
We who seek to save our country from the grip of hatred and misrule are not without resources. We remember how the faith and discipline of a mightily oppressed Black America overthrew the yoke of legal segregation in years of focused struggle. We remember that it was organized popular resistance that finally put an end to the hubris and slaughter of the Vietnam War. In these movements and others that followed the faith community was there to provide counsel and spiritual sustenance and strategic support. Fifty years to the day after Dr. King called out the entrenched and interrelated evils of racism, class oppression, and militarism, faith community leaders in Los Angeles invite everyone who is already in the freedom struggle—and all who now wish to be part of it—to come together to speak out, share strategies, and chart a way forward. 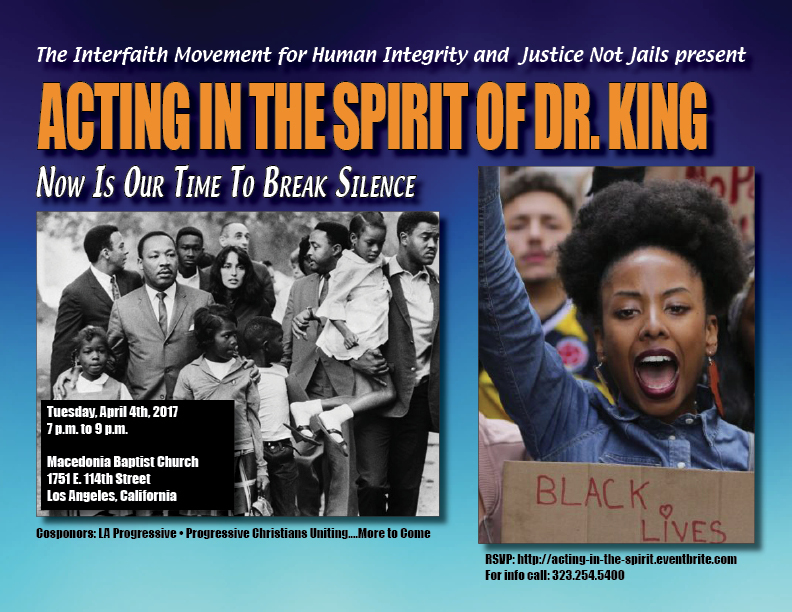 “Acting in the Spirit of Dr. King” is intended to build power: people power, political power, spiritual power. No one who takes part will be able to say they can’t find a place to make a difference. We will not simply articulate the nature of the threats we face; we will not merely vent our outrage; we will set the stage for a year of focused nonviolent action in the spirit of the prophet who was assassinated in Memphis exactly one year after delivering his “Time to Break Silence” sermon in New York. Sponsors: Interfaith Movement for Human Integrity, Justice Not Jails, LA Progressive, Progressive Christians Uniting…More To Come.